Millionaire Series: Organizing your finances. Hey guys! Welcome back to my blog! I while back, I started a Millionaire Series. The purpose of this series is to inspire you to achieve financial freedom. If you haven’t checked out the previous posts in this series, you can read them at the end of this post. Once you have decided that you want to take total control of your financial life. It is time to take action. The very first thing you need to do is become organized. If it’s one thing I learned about Millionaires, it’s that they always know where every dollar is going. They keep a strong eye on their money because they know that every little bit counts. They do this by being extremely organized. Organizing is something that I am really good at, but I actually didn’t really become organized until a couple of years ago. Looking back, I wish that I would have done this earlier, and I highly suggest you do this as soon as you finish high school or college. Here are my top ways to organize your finances. Create a command center in your home. A command center is a place in your home where you can store your mail, has a calendar, shipping supplies, and everything needed for paying bills. I don’t have a fancy command center, but I do have a shelf in my kitchen where I can put all of my incoming and outgoing mail, store my pens and other bill paying supplies, etc. Create a folder on your phone for your paperless bills. 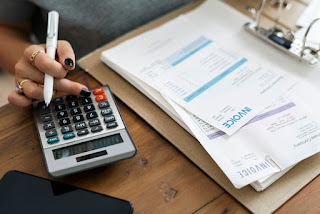 I know that a lot of companies are going paperless these days and I think that is amazing, but this does mean that you must closely monitor your inbox and make sure you are keeping track of those e-bills as well. I only have a couple of e-bills and I always mark them as unread and move them to a folder on my phone. You can also screenshot your bills and save those photos in a folder as well. Promote your blog in my Facebook group, Bombshell Bloggers! See you there! You can use a planner, bullet journal, notebook, or whatever works best for you. But personally, I love having a binder. If you don’t have some type of home management binder, you need one. I love a binder because they are very flexible. I can move my papers around whenever I want and stuff like that. I always grab my binders during back to school season because they have a lot to choose from at that time, but I really love the binders from Zazzle. There are so many to choose from and you can personalize them. My bills go on a little trip from my mailbox, to my command center, to my binder once it is has been opened. This is so nothing gets lost. I came across a printable bill payment log about two years ago online and it changed my life. I can’t believe I am saying that about something so simple, but often we have lots of bills and It can get increasingly difficult over time to manage them all. Even if you have automatic bill pay, it’s always a good idea to have a log of what is due, when it is due, and what the remaining balance is. Rich is the new Black: How to stop living paycheck to paycheck and create the life of your dreams. I’ve been meaning to get a little shelf to help keep my files organized. I like the binder idea. Staying on top of finances is so important. Great tips! needed this! deff want to get more organized with it. There are a number of budgeting apps I recently downloaded,I think it is a sort of command center too.